Bilingual teacher Nancy Serrano provides support to English learners in her eighth-grade English language arts class at Hernández Middle School. Two years ago, Chicago Public Schools officials got some pointed criticism in a report the district commissioned on educating the growing percentage of schoolchildren who are English learners. The report noted that CPS had a long history of ignoring advice on improving its bilingual programs. “We hope this time will be different,” the 2015 report from the Council of the Great City Schools stated. But it wasn’t. CPS officials gave a copy of the report to the mayor’s office, then did nothing. The story illustrates how Chicago has for decades pushed aside the educational needs of tens of thousands of mostly low-income children of color whose native language is not English. The district’s neglect sets up these children for academic failure: Chicago’s English learners perform significantly worse on math and reading tests compared to their peers in other big-city districts. Quality education is critical for these children, because nearly 1 in 5 CPS students are English learners, speaking more than 110 languages. Spanish speakers are the vast majority at 83 percent. Lax oversight, state underfunding and the end of a federal consent decree that in part addressed bilingual education have contributed to Chicago’s long history of violating state bilingual education law, a Chicago Reporter investigation has found. As a result, English learners go without legally required services recommended by experts, such as books in their native language and teachers who speak that language or have English as a Second Language training. Of the 342 schools audited, nearly 71 percent, or 242, had bilingual programs that were in serious violation of state law. The remaining 100 schools were mostly in compliance. The shortage of trained teachers remains acute. At least two dozen audited schools that were required to have bilingual teachers had none. Citywide, at least 100 bilingual and ESL teaching positions remain open at the end of each school year. Dozens of schools also lack materials in students’ native languages or fail to set up bilingual parent committees required under the law. Multiple teachers told the Reporter that they have to translate entire books for children, or use their own money to buy materials in languages other than English. CPS doesn’t track how English learners perform academically once they transition out of bilingual classes, even though experts say that such data is crucial to evaluating bilingual programs. (The state’s new educational plan says schools must track this information starting this year.) Years ago, the University of Chicago Consortium on School Research identified a great need for research on former English learners, especially Hispanic students, to better address their needs. Chicago is just one of dozens of school districts that fail to meet the law. A Reporter analysis of recent state audits of 65 districts found that the vast majority (including CPS) failed to consistently provide children with services such as adequate help in their native language, proper classroom materials and an annual test of English proficiency. Yet districts rarely face sanctions that might force them to take action, such as the potential loss of state bilingual education funding. Nancy Serrano, a bilingual teacher at Hernández Middle School, was an English learner at CPS herself and is acutely aware of the challenges her students face. Hernández Middle School in Gage Park is one of dozens of Southwest Side schools that were out of compliance with state law. The audit found that Hernández failed to provide children with enough native–language support, and that class sizes were too large. Now an eighth-grader, Jasmin has been in bilingual education since kindergarten. She speaks English relatively well, but has not yet developed strong reading and writing skills in English. Over the years, Jasmin didn’t always get the extra help in Spanish that she was entitled to under the law. In fifth grade, her teacher didn’t speak Spanish at all. One recent Tuesday morning in teacher Nancy Serrano’s English language arts classroom, Jasmin struggles as she and the rest of the class analyze an 18th century British poem. 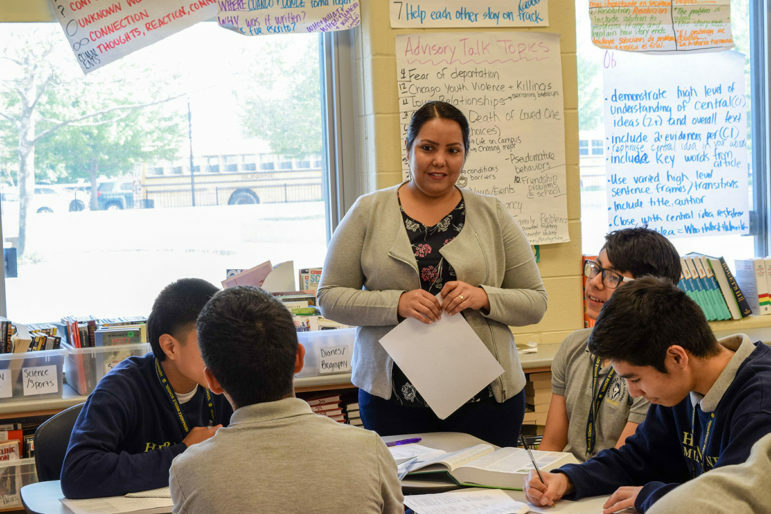 Serrano, who was an English learner in CPS herself, is acutely aware of the challenges her students face and tries to make her lessons culturally relevant. Today, she plays a Mexican ballad to demonstrate how it uses the same rhythmic meter as the poem. Jasmin doesn’t understand several of the words in the poem, so after a nudge from Serrano, she lugs an English dictionary back to her desk to look them up. At home, Jasmin speaks Spanish with her parents, who are immigrants from Mexico. At school, Jasmin tries to hide her language struggles. In sixth grade, a male classmate made fun of her English skills, and the memory still hurts. “I didn’t want to be a snitch and tell the teacher, so I just stayed quiet,” she said. Many English learners have an experience like this, Serrano said, and it can lower their confidence and set them back. Now, when Jasmin is asked to circle words on her paper that she doesn’t know, she skips some, fearing she’ll disappoint her teacher or be mocked by other students. “I don’t want my classmates to know that I don’t know easier words, like the words that they know,” she said. As an eighth-grader, Jasmin is at a critical juncture. If she doesn’t pass the state’s English-proficiency test, she’ll remain in bilingual education in high school and be at a higher risk of dropping out. A 2012 report from University of Chicago researchers found that Hispanic students who were long-term English learners had the worst course performance of any Hispanic student group. Just over half graduated high school in four years, compared with the district’s then-average of 61 percent for other Hispanic students. Jasmin is not sure how she did on the test — her hands shook and butterflies flapped in her stomach as she completed the reading and writing sections. The test, which also includes listening and speaking, recently raised the bar for students to be considered proficient in English and fewer students are passing it. Like Jasmin, thousands of Chicago schoolchildren get stuck in bilingual education for years, never developing strong literacy skills in either their native language or English. Though most children who enter bilingual programs in kindergarten transition out by third or fourth grade, about 1 in 5 English learners stays in bilingual education six years or more, according to CPS data. Hundreds of children have been in the program their entire K-12 experience. Jasmin’s story, and the bigger picture illustrated by Hernández and other schools with subpar and underfunded programs, isn’t what activists envisioned decades ago when they fought for children to be educated in their native language. Under pressure from civil rights leaders, President Lyndon B. Johnson in 1968 signed the first federal law recognizing the specific educational needs of English learners. But before long, those hard-won protections were in jeopardy. Following a wave of anti-immigrant sentiment, several states restricted bilingual education in the late 1990s and early 2000s. English-only instruction expanded as schools faced increasing pressure to prepare students for standardized tests in English. In Chicago around this time, the United Neighborhood Organization opened its first charter school and used the English-only model, winning the support of many Spanish-speaking immigrant parents who were eager for their children to do well in school and adapt to American culture. Nationally, the percentage of English learners receiving help in their native language dramatically declined, even as the number of English learners grew. In Chicago, the U.S. Department of Justice stepped in to defend the rights of English learners as part of the 1980 desegregation consent decree. The decree focused primarily on racial integration, but it also directed the district to provide English learners with “instructional services necessary to assure their effective participation” in school. As white enrollment declined and integration with white students became more difficult, DOJ lawyers focused on the lesser-known bilingual provisions to help keep the entire consent decree in place. When the government pointed to violations, a federal judge updated the decree in 2004 and 2006 to increase protections for English learners. Prompted by community concerns, then-State Sen. Miguel del Valle commissioned researchers to evaluate the state of education for Chicago’s English learners. Del Valle had been looking into the issue for a while and wanted data he could use to push for policy changes. The reports documented a troubling shortage of bilingual teachers — nearly a third of whom were only substitutes — and also found the district transitioned thousands of students out of bilingual education too quickly. Yet CPS officials showed no urgency to fix the problems, researchers recall. As CPS lawyers fought to get rid of the consent decree, a controversial and restrictive federal immigration bill gained traction, sparking nationwide demonstrations and fear in immigrant communities. Many undocumented parents of English learners feared deportation and didn’t want to speak out in court about their children’s education. In 2009, U.S. District Judge Charles Kocoras lifted the consent decree, ending three decades of efforts to integrate Chicago schools. The decree’s bilingual education provisions, according to Kocoras, duplicated protections in state law. The ruling came despite evidence presented by DOJ lawyers in court that the district repeatedly failed to enroll English learners in bilingual education fast enough or provide them with required services. Shortly thereafter, district auditors stopped making routine visits to schools. Over several leadership changes, the district never prioritized the needs of English learners. And the Office of Language and Cultural Education, which oversees bilingual education, was given additional work from other departments, but no extra staff. In 2015, interim CEO Ruiz called for the school-by-school audit, suspecting widespread non-compliance with state law. Since then, district officials say compliance has gotten better. “In general, across the district I’m satisfied with the rate of progress,” said Jorge Macias, a former CPS principal who has led the Office of Language and Cultural Education for just over a year. But CPS gave schools until 2020 to fully comply with the law, and has no plans to withhold state or federal funds earmarked for bilingual education as long as schools demonstrate improvement. Meanwhile, state oversight continues to fall short. Because multiple job vacancies went unfilled this year at the Illinois State Board of Education, just four people are left to monitor dozens of districts and $80 million in state and federal funds for English learners. The state made less than half as many compliance visits to districts as it was supposed to this year. At least three advocacy groups wrote to state board officials recently, expressing concerns about the situation. Sonia Soltero, a bilingual education expert and associate professor at DePaul University, met multiple times with a top state official. She fears decreased compliance monitoring sends the message that English learners aren’t important. Del Valle, a former mayoral candidate who’s been involved in education policy for the past three decades, said it’s troubling that no one is “raising hell” about conditions for English learners. There’s been less systemic organizing on the issue, he said, as Latino advocacy groups opened charter schools or faced budget crunches. Teacher Alice Saba conducts a pull-out English tutoring session with two Arabic-speaking students at Volta Elementary. The school offers native language support in Spanish, Gujarati, and Arabic, and has one of the few Spanish-English dual language programs at CPS. Changing the equation for English learners may well require a shift from the current approach that provides students with native language support solely to help them learn English. Many experts and parents of English learners favor dual language programs, which teach students to read, write and speak two languages with equal proficiency. Chief Education Officer Janice Jackson supports the model and has praised other cities, like New York, that significantly expanded it. But Chicago has been slow to follow suit: By the fall of 2018, CPS will have added a dozen programs over the last two years, bringing the total to 27. All are Spanish-English programs. New York City, by contrast, has added 64 programs in various languages over the last two years. Many parents of English learners in Chicago say their children deserve better access to dual language programs, given the value in the global job market of fluency in multiple languages. “We need the instruction to be offered in any school,” said Maricela Villarreal-Salazar, the former head of the Chicago Multilingual Parent Council. She drives two of her children for 90 minutes each day to Inter-American Magnet, the first CPS school to offer dual language back in the 1970s. It took her four years to get her kids in through the school’s admissions lottery. CPS only allows those schools that already have high-quality bilingual instruction to offer dual language, and schools must have adequate staffing (or close to it) and parent support. Only nine schools applied this year. Macias said many schools choose not to apply because they know they aren’t ready; the selection process is rigorous and involves school visits and classroom observations. Volta Elementary is one of only 100 audited schools with bilingual programs deemed compliant with state law. Two other hurdles will also need to be cleared: the longstanding shortage of bilingual teachers and the state’s chronic underfunding of bilingual programs. In Illinois, disproportionately fewer Latino teaching candidates, many of them poised to become bilingual teachers, pass the basic skills test needed to get a teaching license. Current teachers without bilingual credentials have to pay for extra coursework (though the district will pick up half the tab). Some teachers see the job as unattractive because the work can be more difficult without added pay or support. UCLA’s Gándara says state lawmakers need to pass legislation to offer incentives to become a bilingual teacher, such as free tuition, stipends or smaller class sizes. Without that, dual language will continue to spread slowly. “There’s a lot of ways to think about this, how we could make the position more attractive for people who clearly have very coveted skills,” she said. Illinois’ fiscal crisis has caused “severe and protracted resource and staffing challenges” for public schools statewide, but “the pain is particularly acute for bilingual programs,” State Board of Education spokesperson Jackie Matthews wrote in an email. State legislators have underfunded bilingual education for more than a decade. For the last several years, funding has been basically flat, but because the number of English learners continues to grow, districts get less and less per student. This year, the state reimbursed schools less than 60 cents for every dollar they spent on bilingual education — a rate one advocate described as “horrible.” That has meant fewer teachers, reading materials and summer school options statewide for some 253,000 English learners, who make up 11 percent of all public school students. After advocates like the Latino Policy Forum put pressure on the state’s funding reform commission last fall, Gov. Bruce Rauner and the State Board of Education recommended a 60 percent increase in the state bilingual education budget for the coming school year, an additional $38.4 million.